For the past three years, the Aga Khan Foundation and its partners in India have worked with 400,000 mothers from marginalised communities in rural Bihar, significantly improving infant and young child feeding practices. 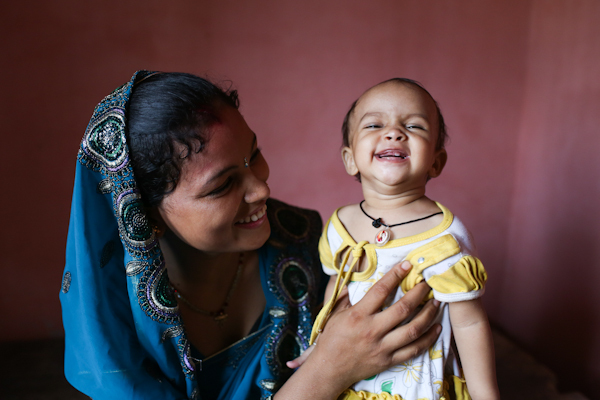 Patna, India, 21 April 2015 - For the past three years, the Aga Khan Foundation (India) and its partners have worked with 400,000 mothers from marginalised communities in rural Bihar, significantly improving infant and young child feeding practices. The DFID-funded programme, Buniyaad – which means “Foundation” in Hindi – has promoted Infant and Young Child Feeding Practices (IYCF) for children under two years of age across three districts: Samastipur, Muzaffarpur and Sitamarhi. the proportion of mothers who were providing age appropriate complementary feeding to their infants at the age of 12 to 13 months increased from 20 percent to 44 percent. AKF (India) and its partners – the Aga Khan Rural Support Programme India, Agragami India and CHARM – have demonstrated a practical model of behaviour change and awareness. A series of workshops have trained 500 women from the community, who then have educated and enabled mothers and other care-givers to ensure the survival and optimal growth of their infants by following good infant feeding practices. Complementing ongoing government programmes for maternal and child healthand nutrition has been a key strategy of the project. To mark the end of the programme AKF hosted a one-day workshop in Patna for organisations working in the field of maternal and child health across India to discuss their key learnings and best practices of relevance for India’s policymakers. AKF is currently drawing up a policy brief on IYCF which will be shared with the Government of India. In India, programmes of the Aga Khan Development Network (AKDN) address a broad spectrum of development issues ranging from cultural revitalisation to education quality, health care to the development of rural areas. These initiatives include 82 schools and educational centres, a 137-bed multi-specialty acute care hospital in Mumbai, development programmes benefitting two million people annually in four Indian states, and the restoration of a World Heritage site in the nation's capital. The Aga Khan Foundation (AKF) focuses on a small number of specific development problems by forming intellectual and financial partnerships with organisations sharing its objectives. With a small staff, a host of cooperating agencies and thousands of volunteers, the Foundation reaches out to vulnerable populations on four continents, irrespective of their race, religion, political persuasion or gender. In India, it focuses on the empowerment and transformation of marginalised communities in Bihar, Delhi, Gujarat, Madhya Pradesh, Maharashtra, Telengana (Hyderabad) and Uttar Pradesh.